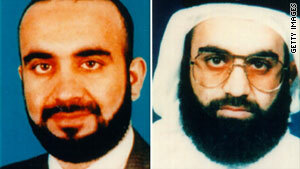 Khalid Sheikh Mohammed reportedly confessed to being the mastermind of the 9/11 attacks after being waterboarded. Washington (CNN) -- Five Guantanamo Bay detainees with alleged ties to the 9/11 conspiracy, including accused mastermind Khalid Sheikh Mohammed, will be transferred to New York to go on trial in civilian court, Attorney General Eric Holder announced Friday. Mohammed, Ramzi Bin al-Shibh, Walid bin Attash, Ali Abdul Aziz Ali and Mustafa Ahmed al-Hawsawi will all be transferred to the U.S. District Court for the Southern District of New York -- a short distance from the World Trade Center towers that were destroyed in the September 11 attacks. "After eight years of delay, those allegedly responsible for the attacks of September 11th will finally face justice," Holder said. He said he expected all five to be tried together and for prosecutors to seek the death penalty. The trial would be open to the public, although some portions that deal with classified information may be closed, Holder said. "Based on all of my experience and based on all of the recommendations and the great work and the research that has been done, I am quite confident that the outcomes in these cases will be successful," he said. He also expressed confidence that an impartial jury would be found "to ensure a fair trial in New York." Of the 2,752 people killed in the 9/11 attacks, 2,606 died when terrorists crashed two hijacked airliners into the World Trade Center towers. Holder also announced that five other detainees held at the U.S. military detention facility at Guantanamo Bay, Cuba, will be sent to military commissions for trial. They were identified as Omar Khadr, Mohammed Kamin, Ibrahim al Qosi, Noor Uthman Muhammed and Abd al-Rahim al-Nashiri. Al-Nashiri is an accused mastermind of the deadly 2000 bombing of the USS Cole; Khadr is a Canadian charged with the 2002 murder of a U.S. military officer in Afghanistan. Khadr was 15 years old when he was captured in July 2002. Holder said a venue for the military commissions has not been set. Mohammed "will be subject to the most exacting demands of justice," President Obama said Friday in Japan. "The American people insist on it, and my administration will insist on it," Obama told reporters at a joint news conference with Japanese Prime Minister Yukio Hatoyama. Mohammed is the confessed organizer of the September 11, 2001, attacks on New York and the Pentagon. But his confession could be called into question during trial. A 2005 Justice Department memo -- released by the Obama administration -- revealed he had been waterboarded 183 times in March 2003. The CIA has also admitted using waterboarding on al-Nashiri, the first person charged in the United States for the 2000 attack on the USS Cole in Yemen that killed 17 U.S. sailors. Obama has called the technique, which simulates drowning, torture. The alleged 9/11 conspirators are among 215 men held by the U.S. military at the Guantanamo prison camp. The Obama administration has vowed to close the detention facility but acknowledges it is unlikely to happen by its self-imposed January 22, 2010, deadline. Bringing some of the world's top terror suspects to be tried in New York has already sparked outrage, as well as security concerns. "Khalid Sheikh Mohammed is the most wanted terrorist in the world. Everyone in the world is going to know precisely where he is at precisely one time," CNN senior legal analyst Jeffrey Toobin said. "The Foley courthouse could become the focus of a great deal of interest from terrorists. That's going to take a tremendous security effort." U.S. Sen. John Cornyn, R-Texas, issued a statement Friday denouncing the decision to try the 9/11 suspects as "common criminals." "The attacks of September 11th were an act of war," Cornyn said. "Reverting to a pre-9/11 approach to fighting terrorism and bringing these dangerous individuals onto U.S. soil needlessly compromises the safety of all Americans. Putting political ideology ahead of the safety of the American people just to fulfill an ill-conceived campaign promise is irresponsible." Texas Rep. Lamar Smith, the top Republican on the House Judiciary Committee, said the decision meant Mohammed and the other defendants would be able to claim new protections, including Miranda and Fourth Amendment rights against unreasonable search and seizure. "America already gives terrorists more constitutional rights than any other country," Smith said. "The administration should not prioritize the rights of terrorists over the rights of Americans to be safe and secure." But Kristen Breitweiser, whose husband was killed on 9/11, said she welcomed the trial. "Some would say New York would now be a target by allowing his [Mohammed's] trial to take place in New York, but I disagree," she told CNN. Breitweiser still lives in the New York area. "It would give many of us access to attend the hearings." She also said that for some who lost loved ones on 9/11, "this will be our opportunity to see justice served and have our day in court. "Our ability to prosecute terrorists successfully in open courtrooms has less to do with the our judicial process and more to do with Bush's policy on torture that will make these prosecutions more difficult," she said. CNN Justice Producer Terry Frieden in Washington and Chris Kokenes in New York contributed to this report.